Students "Take Action" with Energy Efficiency - UGI Utilities, Inc. 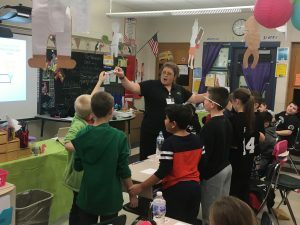 The 5th grade teachers at Greater Nanticoke Area Elementary Center didn’t wait for Earth Day to teach their students about Energy Efficiency. Instead, they invited UGI into their school for some new learning experiences. The Energy Stick is a plastic tube with wires inside that control the sound transducer, battery power supply, and LED lights; and contains silver bands on the ends, which are electrodes. Using both hands, individually, the students could grip the Energy Stick with a hand on each silver ring and the lights flashed. Once they let go, the lights went off. The students learned that since human bodies conduct electricity, by holding onto both ends of the stick, their bodies closed the electrical circuit needed to let the current flow continuously and activate all the “guts” of the stick. “When educating students, it’s important for school districts to work with the community, and we found a great partnership with UGI. It’s so exciting to see the student get involved in the lesson during class, and then they take their kits home and extend their learning with their family. UGI is not only gifting the students with an Energy Saving Kit, but they are opening up the lines of communication at home by discussing school activities. That’s really exciting!” said Ms. Ferro, 5th Grade ELA Teacher. For teachers who would like to enroll their class, or learn more about the Think! Energy Program with UGI, please visit www.thinkenergy.org/ugi.